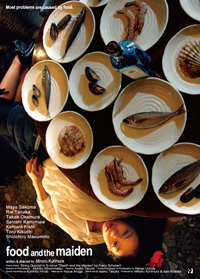 Saori Wada (Mayu Sakuma) is a cook at a dining bar named "Coo". Saori loves cooking. There is a patron at the restaurant named Kujo (Satoshi Kamimura) who has never touched her cooking. Saori gives Kujo a bag of sandwiches to eat at home, but she later learns he gave it to a Buddhist monk on the street. Saori doesn't know that Kujo only eats food he cooks himself. Mie Tabata (Rie Tanaka) is bulimic and she lives with her boyfriend Takeshi Kohinata (Kentaro Kishi) who eats all day. One day, Mie learns that she is pregnant. She asks Takeshi if he wants to have the baby or have it killed. Takeshi promises he will feed the baby. That day he disappears. Mie tells her friends she ate him. Middle-aged man Hisao Konaka (Toru Kikuchi) runs a failing business. He's afraid whether he can keep feeding his wife Sakie (Takae Okamura), who has a voracious appetite, and their teenage daughter Yumi. Hisao hasn't eaten for days. One night, he loses control and empties Yumi's lunch box for the next day.